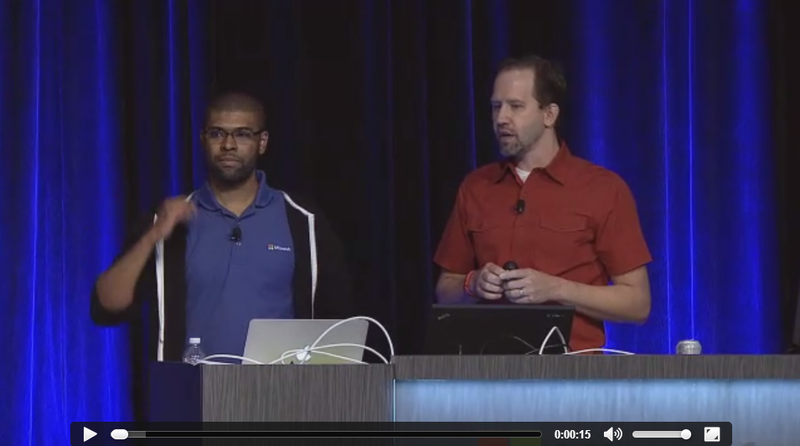 We announced vNext in May and did some great talks at TechEd. Open Source from the start and runs on Windows, Mac, and Linux. No "build to disk" step, just refresh and go with runtime in-memory compilation from the Open Source Roslyn compiler. Optional cloud optimized local install the CoreCLR that runs great in Azure. 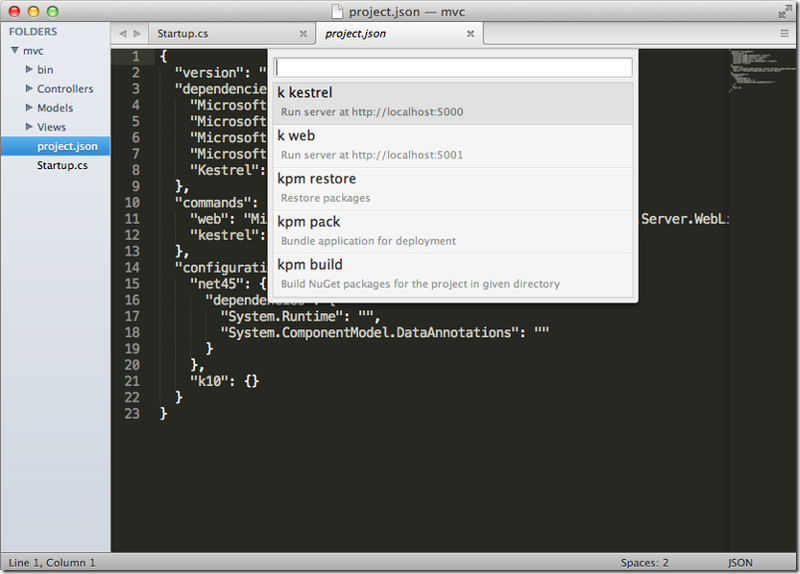 Want to use a Mac and Sublime rather than Windows and VS? Sure. 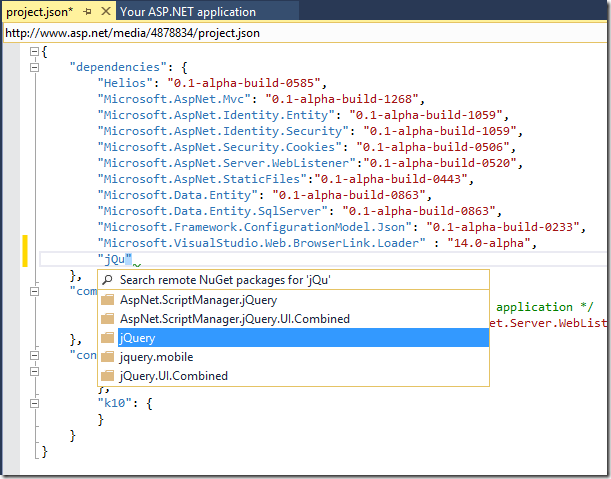 NuGet Packages easy to bring in the new project.json system. But, you can also swap in the source for your favorite libraries! Since then we've seen the release of betas of the next version of Visual Studio, like Visual Studio "14" CTP 3. This version of VS includes the ASP.NET vNext alpha 3 packages plus initial tooling. The project system is changing and this VS14 build includes Intellisense for the new Project.json files. Separate from ASP.NET vNext, this build of VS14 also includes .NET Native, C++ updates, Shared Projects, as well as little things like retina icons for HiDPI displays. ASP.NET vNext is very modular and will include customizable command-line scaffolding . As with all of ASP.NET vNext, it's easy and alpha, but we've got blog posts up showing you how to get started with scaffolding. We've also got details on how to customize (of course) scaffolding for your personal needs. Sure, why not? We're working on a Sublime Text 3 plugin at https://github.com/ligershark/Kulture that means you'll be able to develop ASP.NET vNext apps in your favorite IDE. There's a quick YouTube video here. 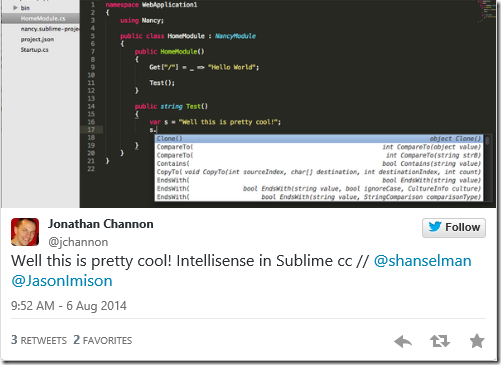 There's also some clever community members with C# Intellisense working! The LEGO pieces are snapping together nicely. Folks have the Nancy framework running on ASP.NET vNext and OSX. Why not F# in ASP.NET vNext? Apps can also opt in to new C# 6 features easily with a quick change to project.json. I'm sure I missed something. Sound off in the comments! Sponsor: Many thanks to my friends at Raygun for sponsoring the feed this week. I *love* Raygun and use it myself. It's amazing. Get notified of your software’s bugs as they happen! Raygun.io has error tracking solutions for every major programming language and platform - Start a free trial in under a minute! How would I do this on Linux? Quick check, will Roslyn and the CoreCLR work with RyuJIT? I've read that some features (like the side-by-side runtimes) won't work when you're using WebForms. Is there a list of features that will and will not be available when using WebForms? It's not clear to me whether WebForms is part of ASP.NET vNext, or whether it is a separate thing. Like, today you have WebForms, MVC, WebAPI and WebPages. Is vNext a combination of MVC, WebAPI, WebPages, SignalR, ...? Or is vNext "everything", including WebForms? Can someone clarify this for me of point to somewhere where I can read up about it? Scott, can you confirm that latest (public) VisualStudio "14" CTP3 can be installed side-by-side with VisualStudio 2013 Update3? What is the status of Katana regarding to VNext? "No compile, just refresh and go with runtime in-memory compilation"
@Brian Hall things on this podcast actually conflict with some other things we have read elsewhere. He says that Roslyn compiler and therefore save/refresh will be available in Web Forms but I have seen other sources claim otherwise. @Brian Hall - Could you please summarize what will happen with WebForms in vNext, so we don't have to listen to a one hour podcast? Thanks! What is going to happen to the WPF, winforms, workflow foundation and other non asp.net areas in ASP.NET vNext? Will it exist in vNext or is prefixing it with ASP.NET just poor naming by MS? I'm surprised there are not more people raising this question? Or maybe I'm looking in the wrong places. I too am interested in hearing more about Katana and Helios. @Stephen Brannan: WPF, winforms, workflow foundation, etc. are not part of ASP.NET vNext, so Scott do not discuss them here. 1) Is ASP.NET vNext an off-shoot of the .NET Framework or is it the next version of THE framework? i.e., .NET 3.5 -> .NET 4 -> .NET 4.5 -> .NET vNext? 2) "Open Source from the start and runs on Windows, Mac, and Linux." Is this support for a sub-set of classes in .NET or will everything work? For example, the System.IO Namespace - can we write some code that writes some files out to the disk and have it work on all 3 platforms? 3) If the .NET Framework and .NET vNEXT are two separate entities, when new versions of the Framework is released, will vNext get support, as well? @Stephen The "non ASP.NET areas" will continue to be unrelated to ASP.NET and thus not part of any of the announced changes to ASP.NET. @SlavoF and @Steve Smith I think Tim V really nailed what I was trying to ask. His question really encompasses the technologies I was asking about as well as the rest of the .net framework. That's the clarification I'd like to hear more about. Ok I found a good reference. There is also .NET vNext below ASP.NET vNext. Which will have the rest of the framework in it from what I read in this blog post. 1. I test ASP.net vNext on 4 major Linux versions since June and the biggest problem is fast moving target (vNext) being kept in sync with another fast moving target - mono. But it works. From the perspective of .net/mono developer - this is just netfx 4.5. vNext will add c# v6 and better packaging - start small - no more System.Web. nuGET what you need. 2. System.IO works on Linux and Mac and to some extent on iOS and Android. There are some problems how different OSes interpret current dir or root or how many roots (forest). I'm not a big reader and that alone prolly gives me away, but at the same time I think their is an understanding to be made here. I think many wallow in change rather embrace it even to the corporate level of big business deciding its time to re-write software. I think their are certainly decisions made where upgrades and re-writes become inevitable for future progress but at the same time, I haven't yet seen many business offering up bucks to bring in MVC specialist to re-write legacy system built using older versions of .NET that include custom MVC built architectures. Essentially we all as developers adapt to change, we live or die. I think prolly the longest lasting and still in business today even with the bells and trickets that entity framework has to offer is ADO.NET. Finally point: if vNExt works it works otherwise it will become a pastime like other other attempts such as Silver light etc. It's really nice to see Microsoft embracing open source like this. The more portable c# becomes the better. Really looking forward to vNext and its the cross-platform capabilities. Like some of the other commenters I'm confused whether WebForms will be supported in vNext. I've read some articles that say definitively no, but others that make it seem like it may. Would love to get clarification on this. It looks like vNext is going to be based on OWIN/Katana. Are there any posts/docs on how to convert existing MVC 5 applications to OWIN/Katana so we're ready to take advantage of vNext? This means no bin deployable core framework/self hosting options will be available for WebForms. Plus above all this my understanding is that you will need .NET 4.5.1 for bin deployable core framework to work anyway. Dependency injection everywhere. Really? That's a lot of duct tape to be able to ease testing/mocking. The decoupling defence is not really a good one either. It's more about testing. Plus it makes for worse, less easy to understand code. This is not a good development. Big smiley face from me for customizable command-line scaffolding, but I'm curious how I can create different items. For example, I'd like to scaffold EditorTemplates/Account.cshtml and then use Html.EditorForModel() in my Create and Edit views. In MvcScaffolding language this is called creating custom scaffolders. Would someone kindly point me in the right direction? VS Wish list request: Add a toolbar and/or keyboard shortcut for the Debug->Exceptions->"Common Language Runtime"->Thrown checkbox. @Diego: Just because they bake dependency injection into the framework does not mean you *have* to use it. It just makes it more convenient if you do. Great to see more news about vNext here. By the way, I saw in another post here, your use a synology nas for somethings (Plex). Would be great if we could use vNext (ASP.net) on a Syno NAS e.g. for Webprojects! As much as I love C#, .NET, et al, I will not to go back to Windows to use it - no way! Getting this running on Linux would improve my life somewhat. Thanks for listening to our rants on your "Aint your pappa's MS" article, and actually doing something about it. I have to say I'm certainly excited by what the future holds for .NET developers with vNext. The ability to host on Linux holds some great promise. There is one question in my mind that doesn't get pushed to the side with the well it's currently just a CTP. Visual Studio currently offers what in my opinion is great remote debugging toolset. Are we going to have some way of doing this when our vNext applications are hosted on Linux? vNext team is doing awesome job. I've been following vNext since it's announced. By when it's expected to go live, so we can start using in Production? Hello. How configure Apache2 Web Server for works with asp.net VNext?